Tracing the path of progress in VA medical research does not involve drawing a straight line. It requires, rather, sketching a jagged streak forward—the many high points marked by significant findings and the development of medical advances, the few downticks indicating an occasional disappointment—the trend always upward toward promise and hope for improved health care and a better quality of life. Development of a practical, implantable cardiac pacemaker. Although this research program produced more than enough accomplishments to completely occupy its text, this history also attempts to depict the pioneers who carved that path of progress. 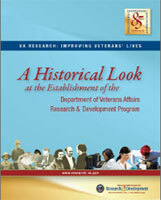 In large measure, the history of VA medical research is their story.